By Elizabeth Byrd Wood, senior content manager at the National Trust for Historic Preservation. For the last two decades, historic sites around the country have been engaged in a steady, thoughtful discussion about slavery and race. This conversation isn’t always comfortable or easy, but it happens consistently and it happens with the authenticity and veracity that can only happen in an old place, in a place where history happened and history is preserved, and history is connected to the present. This year the Preservation Leadership Forum blog takes a look at National Trust Historic Sites and how their interpretation of slavery has evolved and changed over the years. 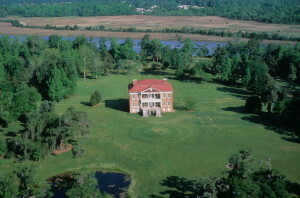 In this month’s post we took a moment to catch up with George McDaniel, the executive director of Drayton Hall, about the evolution of slavery interpretation at his site. A day after the tragic shooting at Emanuel AME Church in Charleston, South Carolina, Drayton Hall director George McDaniel and his staff were still trying to comprehend the enormity of the event. Yet McDaniel, who is retiring in September after 26 years of overseeing Drayton Hall, still firmly believes that an understanding of history—both the good and the bad—has increasing relevance in today’s world and can bring people together to work through what he calls “troublesome” history. In a recent interview, McDaniel spoke with conviction about the crucial role of historic sites in telling the full story of the nation’s history and in dispelling falsehoods and misperceptions. “It is even more important now to use historic sites to build cross-racial bridges,” according to McDaniel. He goes on to note that African American history is integral to American history, and people who claim otherwise are historically illiterate. “There is no ‘their’ or ‘my’ history, only ‘our’ history,” he says. Click here to read the complete Forum interview.